It's sad when a beloved series loses it's mojo. Even more sad when the best thing about the book is it's cover. The poor Dark Hunter series has at book number 20, lost that loving feeling for me. 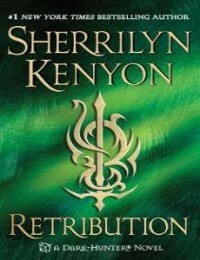 I never ever thought I'd say this, but Retribution was a do not finish for me. It pains me to write it, because as I've stated before this is one of my all time favorite series. Pg 42 ~"Still he didn't take a lickin and not give one back." og.79 Other than the fact that you're as loco as a three tailed cat in a rocking chair factory, I'm as clueless as a newborn colt." pg. 86: "It's not what you think Z. Turn on those god powers and use them. I am not responsible for her knowledge of nothing." Pg. 87: Ew. Someone was socially awkward. She wasn't sure at this point if she liked Z or not. He was rather off putting. made it impossible for me to go any further. I know that Jesse was born in the 1800s and was a gunslinger, but seriously, I don't even think gunslingers talked like that. When the actual storyline started, I groaned out loud. It was another-I'm going to hate you for the whole book because I think you're evil till I find out I was lied to then I won't be able to live without you storyline I just couldn't get into it as much as I forced myself to keep reading it. Another issue I had was that when the Dark Hunters whip out their cell phones or computers they are all apple products. All the I phone product placements just didn't sit well with me for some reason. I mean, I don't even see J.R. Ward doing such obvious product placements with her popular Black Dagger Brotherhood Series, and if anyone could get away with it, she could. pg.194 Nothing left of Jonah except a shimmering film that graced the floor. Iridescent like the wings of a summer butterfly. I can't remember the last time I was so disappointed in a series book. I just want the old Dark Hunter series back, and if I have to wait through 6 more stupid Nick YA books to get it then, I will,. But please, please don't churn out another DH book just trying to make the fans happy. because you've just about lost this fan doing that. I'd rather wait and have a quality one then what the last 3 have been. This review is kinda harsh, but mainly because of how drastically disappointed I was in reading this book. That being said, I'll still buy whatever Dark Hunter book comes out next. What can I say? I'm an optimist and the next one can't any worse.